A brilliant supernova (right) explodes in the galaxy UGC 9379, located about 360 million light-years from Earth, in this before-and-after view. The left image was taken by the Sloan Digital Sky Survey, while the right image was obtained with a 60-inch telescope at the Palomar Observatory. The most massive and luminous stars were long suspected to explode when they die, and astronomers now have the most direct evidence yet that these cosmic behemoths go out with a bang. These findings shed light on the star explosions that provide the universe with the ingredients for planets and life, the researchers added. The intense heat of Wolf-Rayet stars forces their matter apart, making them extraordinarily windy stars. They usually lose the mass equivalent to that of the Earth each year, blowing winds at up to 5.6 million mph (9 million km/h). Astronomers long suspected that Wolf-Rayet stars violently self-destructed as supernovas, the most powerful stellar explosions in the universe. These outbursts are bright enough to momentarily outshine their entire galaxies, and enrich galaxies with heavy elements that eventually become the building blocks for planets and life. However, the gigantic amounts of matter these stars blow out usually obscure them completely, so scientists weren't sure how they form, live and die. "Finding what kind of star exploded, after it already exploded, is, of course, a hard problem, since the explosion destroys much of the information," said study author Avishay Gal-Yam, an astrophysicist at the Weizmann Institute of Science in Israel. Some researchers even raised doubts as to whether Wolf-Rayet stars detonated as supernovas at all. "Some modelers predict that massive Wolf-Rayet stars will collapse into a black hole 'quietly,' without making a luminous supernova," Gal-Yam told Space.com. Now, for the first time, scientists have direct confirmation that a Wolf-Rayet star died in a supernova. They detail their findings in the May 22 issue of the journal Nature. The researchers focused on a supernova named SN 2013cu, which exploded about 360 million light-years away from Earth in the Bootes constellation. This explosion was a Type IIb supernova, meaning it took place after the core of its star ran out of fuel, collapsing into an extraordinarily dense nugget in a fraction of a second and rebounding with a blast outward. What is left over after such supernovas is either a neutron star or a black hole. 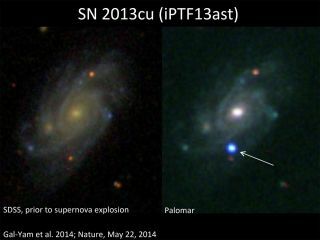 By surveying the sky with the intermediate Palomar Transient Factory (iPTF), a project that charts the sky with a telescope mounted with a robotic observing system, the researchers discovered the supernova very soon after it happened. "We now send high-quality supernova alerts to astronomers all around the globe in less than 40 minutes," said study co-author Peter Nugent, a researcher at the University of California, Berkeley. The scientists next rallied ground- and space-based telescopes across the world to observe the infant supernova approximately 5.7 hours and 15 hours after it detonated. "Newly developed observational capabilities now enable us to study exploding stars in ways we could only dream of before," Gal-Yam said. "We are moving towards real-time studies of supernovae." The explosion ionized surrounding molecules in an ultraviolet flash, giving them an electric charge. The ionized material that surrounded the star emits light that "tells us the elemental composition of the wind, and hence the surface composition of the star as it was just before it exploded," Gal-Yam said. "That is a very powerful clue about the nature of the exploding star and how it evolved before it exploded, and this is the first time we managed to get this information." That opportunity lasts only for a day before the supernova blast wave sweeps the ionization away, Gal-Yam added. This light suggested the precursor of the supernova was a nitrogen-rich Wolf-Rayet star. "This is the smoking gun," Nugent said. "For the first time, we can directly point to an observation and say that this type of Wolf-Rayet star leads to this kind of Type IIb supernova." "When I identified the first example of a Type IIb supernova in 1987, I dreamed that someday we would have direct evidence of what kind of star exploded," said study co-author Alex Filippenko, a researcher at the University of California, Berkeley. "It's refreshing that we can now say that Wolf-Rayet stars are responsible, at least in some cases." Future studies could analyze more Wolf-Rayet stars, to see if these violent deaths are standard for them. "If we can show that this is the norm for such massive stars, it would mean that new theories will have to be developed to explain how you can make a black hole and still throw out a lot of material and a lot of energy to make a luminous supernova," Gal-Yam said.